The airport serves an enormous selection of over 250 non-stop destinations and has become a significant hub for the German airline Deutsche Lufthansa, which is Europe's biggest. Frankfurt Airport features a good range of affordable ground transport, running into the city's main districts, such as the S-Bahn Altstadt, Bahnhofsviertel, Bockenheim, Höchst, Nordend, Ostend and Sachsenhausen. S-Bahn trains are especially popular here and rail stations are sited on the first floor of Terminal 1 and within the AIRail Terminal, with rail and fly tickets offering good value. Buses and airport taxis link downtown Frankfurt and the nearby cities, such as Darmstadt, Hanau, Mainz and Offenbach Am Main. 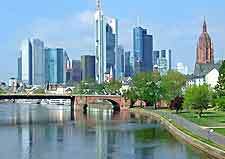 Located in the German state of Hesse, where it is the biggest and most important city, Frankfurt is full of stunning skyscrapers, creating an impressive modern skyline, particularly when viewed from the River Main. Germany's financial centre, Frankfurt regularly hosts many enormous trade fairs, which regularly attract both businessmen and tourists. Frankfurt Airport (FRA) offers easy access to a wealth of sightseeing, such as the Goethehaus, Städel Art Institute, Bockenheim Strasse, St. Bartholomäus Cathedral and the tall Post Office Tower, which dominates the area and features a popular observation platform.